Artists Heny Rikenma, Peter Tonningsen, Jamie Banes and Liz Hickok reference the molecular structure of crystals in a variety of ways. Cubism, among other innovations, introduced into painting the faceting or fracturing of space, reflecting both the increased pace of life at the height of industrialization a century ago, and the recognition that the objective depiction of reality — as practiced by nineteenth-century realists — was an artistic convention that enjoyed a popular consensus. A century later, we no longer share a common conception of reality, or art. “Crystallography,” features paintings (Henry Rikena), photographs (Peter Tonningsen), sculptures (Jamie Banes) and video-based photos (Liz Hickok). The title references the study of the molecular structures in crystals; this show updates the fractured/faceted vision of Cubism while expanding its focus beyond visual analysis of form into social commentary. Contemporary consciousness in the media-glut age is a competition between and synthesis of breakup and cohesion; the centrifugal and the centripetal; architectonic construction and tectonic demolition. Change is the only constant. Rikena’s large abstract paintings on canvas, with their complex cellular structures (biological and architectural) outlined in graphite, deploy Cubist faceting for expressionistic ends. Instead of Cubism’s punning guitar, pipe and wine-glass forms, these immersive, dynamic works take on Abstract Expressionist scale and power. Viewers perusing “Tag" or “Leagues" may think of deKooning, Tobey, or the semi-abstract Surrealist, Matta. The artist wants us to have a meditative experience while viewing these works; if so, they are not so much visions of nothingness, meant to be filled by the viewer’s imagination, as visionary evocations of the continual metamorphosis of being and becoming. Toningsen’s stunning digital composite photographs are similarly layered and complex, but he is concerned with the dynamism of contemporary urban life, “crowded with buildings, signs,” with motion proceeding “in seemingly endless directions.” If digital technology has made the intricate assembly of hundreds or thousands of photographs possible in a way that scissor and paste could not, Tonnningsen’s “Megalopolis" series, with shots taken from cities around the world that he has structured into matrices of tiny details, like jigsaw puzzles, echo Cézanne’s painterly patches of color, woven into perceptual tapestries. David Hockney’s Polaroid mosaics are a photographic precedent. Tonningsen’s enthusiastic view of urbanization harks back spiritually to the photographers who documented the building of skyscrapers in New York, reminding us in these doubtful days, without irony, of the once and perhaps the future romance of progress. 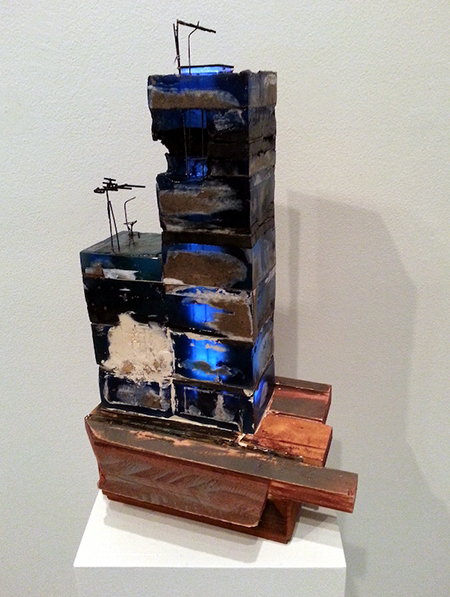 Banes, who hails from a family in the construction business, builds small sculptures that read as architecture under construction or in the process of destruction. He considers “architecture as living entity,” subject to “origin and decay.” “The speed at which this life-cycle revolves in our own area is influential in my work.” The eccentric models that he fashions from found or bartered materials (including LED lights) serve, to quote gallerist Danielle Fox, as “metaphors for shelter and home as something that is not fixed but is moving and shifting through time.” "Chalet" depicts a small house or cabin as a transparent framework of joists and beams that clings to the wall like a mountaineer with ropes and bracing. “Bystander" is a seemingly scorched, blackened skyscraper or apartment block from which protrudes spindly metal structures — are they antennae or weaponry? Hickok, known for her humorous tableaux of San Francisco composed from colored jello, shows dye sublimation photographs on aluminum from architectural models that she has used to cultivate liquid crystal formations. She builds subject matter that allows her to comment on urbanization and pollution without being tied to real-world specifics: images that are “no longer,” in her words, “perfect portals into reality, but ... [foster a] multidimensional perspective that expands our notions of the photographic instant and reorders the appearance of photographic space.” “Electrostatic" depicts a chain-link fence (not real, of course) sprouting both fungal and crystalline growths. "Lithosphere and Asthenosphere," named after layers of earth’s crust, show the crystal forms without reference to man-made structures. They allude to natural chemical processes that will continue — with or without us.